Until about a year ago, I didn’t really have a daily morning ritual. I wasn’t so addicted to my computer that I had to check it the moment I woke up. At the time I didn’t even follow any blogs or other news sources. Since I got a laptop though that kind of changed. My laptop is with hand’s reach of my bed and every morning I sit at least half an hour in bed, slowly waking up and reading all the items in my news reader. Among those items are a great collection of geeky web comics. I’ll share with you a couple of my favourites. Every geek should read xkcd; it’s a weird mix of humor, math, romance and language. 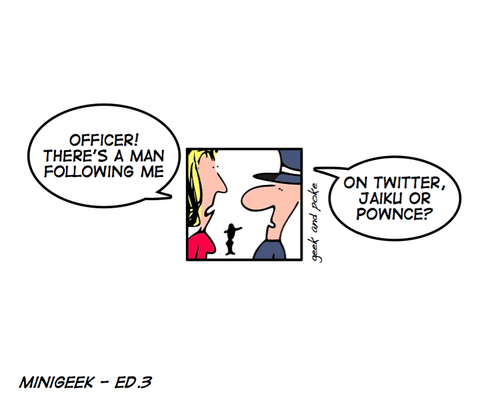 Cute comic with some great humor on blogging, Twitter and other “social media”. Surprisingly it’s not always Apple related. I mainly like the cat and dog comics here. The rest can be funny at times, but the cat and dog are always hilarious. Funny comic about a geeky couple, Greg and Liz. While I’m not doing a PHD, I am still trying to finish my master’s and this comic sometimes captures exactly how I’m feeling.